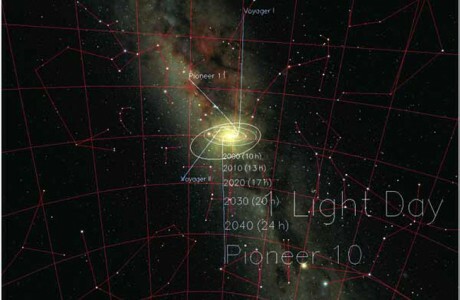 We start with our Sun and its family of planets, seen against the band of the Milky Way. 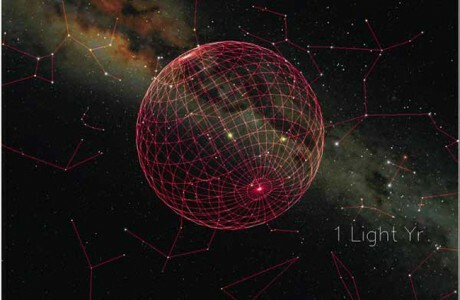 The trajectories of our most distant space probes are plotted to their positions in 2050, the equivalent of the distance light travels in a day. 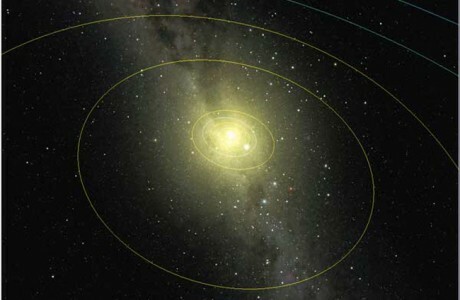 At a distance of one light-week, our solar system is lost in the Sun's glare. 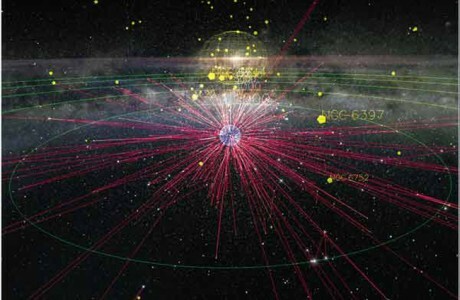 Even farther out is a collection of cometary objects called the Oort Cloud, depicted as a sphere one light-year across. 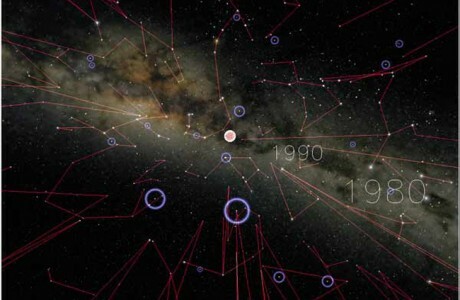 From a distance of some 20 light-years, constellation outlines converge toward the Earth; the positions of known planets outside the solar system are highlighted with blue circles. 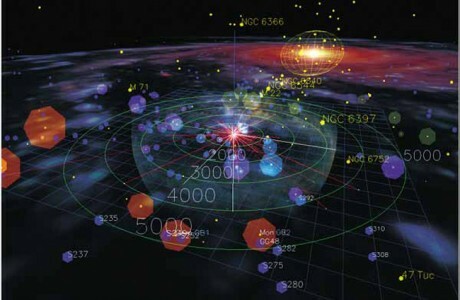 A vantage point 1,000 light-years away shows the sphere of radio signals (barely discernible), distorted constellation lines, and globular star clusters. 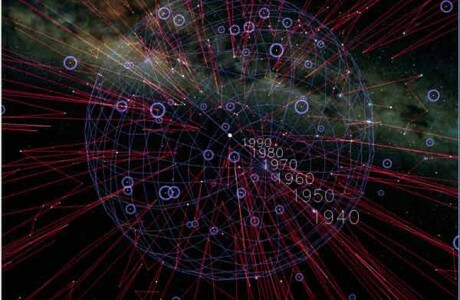 The Earth's most powerful radio signals have by now expanded to fill a sphere 65 light-years in radius. 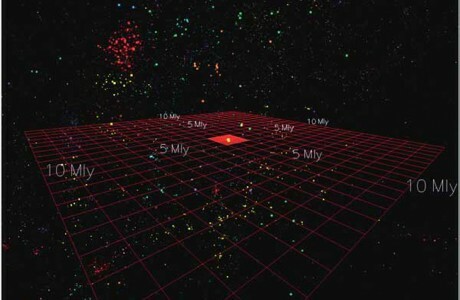 The star clusters nearest our own indicate the flatness of our home galaxy, the Milky Way, whose center is visible in the upper right. 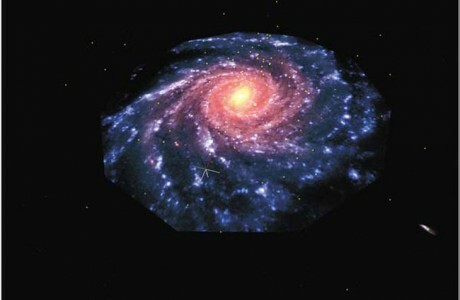 Home to several hundred billion stars, our galaxy is represented here as a typical four-arm, barred spiral. 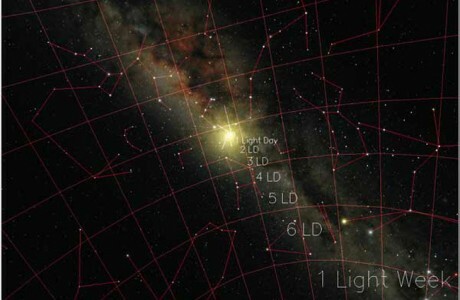 Our nearest galactic neighbors, members of a collection called the Local Group, lie within 2 million light-years or so. 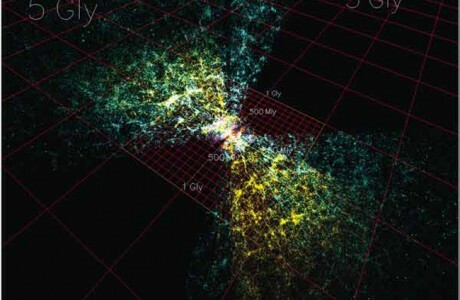 In the regions between clusters of galaxies, a square grid marks out distances to 10 million light-years from Earth. 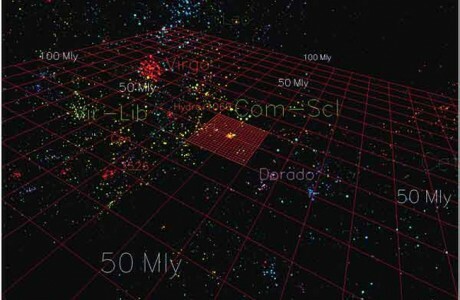 The Virgo Cluster includes some 1,000 galaxies (red cluster of points, upper left of center), with a reference grid out to 100 million light-years. 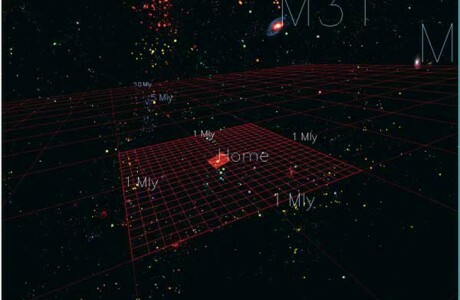 New astronomical surveys reveal galaxies and clusters several hundred million light-years from home and begin to unveil the large-scale structure of the universe. 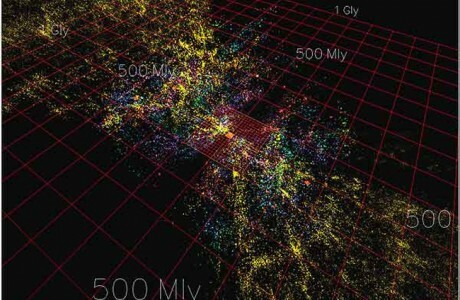 At greater distance, the large-scale pattern is further discerned. 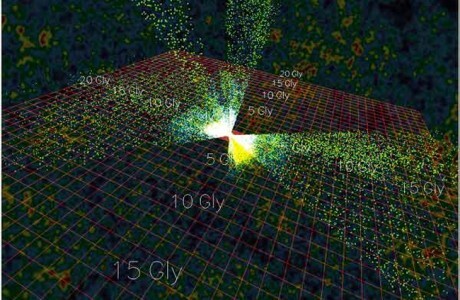 Quasars, billions of light-years away from Earth, are highlighted against the most distant radiation detectable, the cosmic microwave background.